Taiwan doesn’t need F-16s; it needs an anti-access strategy. The time has come for the United States to consider ending the sale of upgrades for F-16 fighter aircraft to Taiwan and instead shift military sales and cooperation to emphasize anti-access capabilities and concepts of operation. U.S. policy toward Taiwan has always been a delicate dance. The United States supports a “one China” policy and it maintains a strategic relationship with Beijing, but Washington is legislatively required to support Taiwan’s “sufficient self-defense capabilities” thanks to the Taiwan Relations Act. A certain amount of diplomatic savvy is required to simultaneously pursue such seemingly contradictory policies. Against this backdrop, decisions relating to F-16 sales have become a leading indicator of U.S. intentions vis-à-vis Beijing and Taipei. If the United States sells new F-16s to Taiwan, Beijing may perceive it as a threat to the Sino-U.S. strategic relationship and the PRC’s position in the region. If the United States refuses to arm Taiwan at all, it would not only be found in violation of the Taiwan Relations Act, but Taiwan would then be forced to make the grand strategic assumption that it no longer has U.S. support. The Obama administration has continued the delicate dance of its predecessors, offering an interim solution of not shipping F-16s to Taiwan but instead offering to help modernize Taiwan’s existing fleet. Such a Goldilocks solution has helped keep the peace, but it cannot continue indefinitely. F-16s are already outmoded by current generation fighters, and there are realistic limits to how much you can simply maintain and upgrade an existing fleet as it ages; eventually new kit will be necessary. Yet by the time the United States is “forced” to again sell F-16s to Taiwan, it will inevitably be in the context of having refrained from selling Taiwan F-16s for decades — this will predictably stir the ire of Beijing, far more so than if U.S. administrations had simply sold new F-16s to Taipei regularly. But there’s an even bigger problem with the kabuki theater surrounding F-16 sales and upgrades — it’s a feckless capability that in fact does not provide Taiwan with “sufficient self-defense capabilities,” as law requires. The reality of the military balance between the PRC and Taiwan is that the former overwhelms the latter in the air. Taiwan has no chance of air superiority on its own. So arming Taiwan with inferior fighters in fewer numbers than their most likely adversary doesn’t restore a military balance in the air domain; it quixotically wastes Taiwan’s limited defense budget. China has long been opposed to F-16 sales to Taiwan, and more vocal about it than other categories of arms sales. So, I say, offer this symbolic concession for the sake of Sino-U.S. relations, but do it in parallel with a shift in the U.S.-Taiwan defense program. As I’ve argued before Congress and in recent policy analysis for the Center for a New American Security and the National Bureau of Asian Research, helping allies and partners in Asia move toward a more defensive military orientation can be more cost effective than trying to ensure offense-dominance, and it puts the region on a more stable footing. This logic applies to Taiwan as well. Taiwan’s ability to defend itself doesn’t require the ability to project power or achieve superiority in any warfighting domain; that’s a very U.S.-centric construct for how to win in combat. Instead, Taiwan defense requires denying a larger and more advanced adversary its objectives. 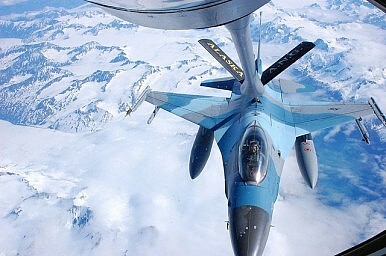 For Taiwan, the most efficient means of doing so is through an anti-access military strategy that strings together relatively low-cost systems — such as undersea mines, drones, air and missile defense, and land-based anti-ship cruise missiles, to name a few — with defensively minded concepts of operation designed to nullify PRC advantages or impose costs on any attempts by the PRC to project power. The F-16 dance puts U.S. policy in a precarious position, and is eventually destined to become the worst of both worlds: angering Beijing while failing to actually equip Taiwan with what it needs. Taiwan’s security is best assured by being less tiger and more turtle. Such a shift doesn’t require F-16s; it requires an anti-access strategy.